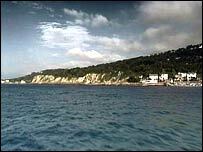 BBC NEWS | UK | England | Hampshire | Has Undercliff saga eroded trust? Has Undercliff saga eroded trust? It is a scandal that has rocked an island community, threatening to hit taxpayers' pockets by potentially millions of pounds. It resulted in the suspension of seven council officers, including the deputy chief executive, followed by sackings, a resignation and an early retirement. A nine-month internal investigation has now been completed into why the Isle of Wight Council was able to award a multi-million pound contract to an international firm - High Point Rendel (HPR) - without any tendering process. This broke both EU and UK law, as well as the council's own constitution. A Hampshire police investigation, led by the serious and organised crime unit, has now begun. And BBC News can reveal that one of the officers suspended over the affair was involved in a similar scandal elsewhere in the UK, involving the same contractors. 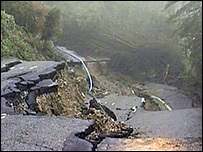 The illegal contract on the Isle of Wight was awarded over plans to repair a road on the island's southeastern coastline, Undercliff Drive, which was badly damaged by a landslip in 2001. The work, estimated to cost £5.6m, was given to HPR but this rose to £18m and it was later discovered the job was given to the firm without any competition across Europe. Nearly £3m of council money has already been spent on the plans - but last week the whole scheme was scrapped for good. Awarding a contract without tender puts the council, in theory, at risk of being sued for millions of pounds by those who missed out on the deal, potentially affecting island taxpayers. A dossier of evidence gathered during the council's own inquiry has now been passed to police. "We can confirm we have received a complaint from the chief executive of the Isle of Wight Council in respect of issues arising from an investigation into the procurement of work on the Undercliff drive project," a police spokesperson said. One senior council officer suspended over the Undercliff contract - director of regeneration and the environment Derek Rowell - was involved in a similar incident when he worked in the northern seaside resort of Scarborough. At the time he was the borough council's director of technical services, responsible for coastal protection schemes. Again, the firm involved was HPR, which was again awarded an illegal contract - without any competition - to oversee a £40m sea defence project at the resort. Mr Rowell is among four senior and three more junior council officers who have been suspended on full pay throughout the Isle of Wight Council's own investigation. 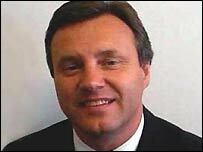 As a result of the inquiry, Mr Rowell has agreed to resign. John Lawson, the deputy chief executive, has been sacked. Steve Matthews, head of engineering, was also sacked. Paul Wilkinson, director of finance, agreed to retire early. The more junior officers face ongoing disciplinary action. Mr Rowell has also previously been one of several former Scarborough council officers investigated over his role in the affair there. 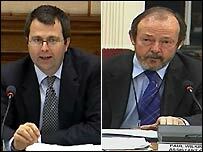 An inquiry by local government trouble-shooter Richard Penn in June 2005 said a report presented by Mr Rowell to Scarborough council's cabinet in 2002 over the legality of the HPR contract, was "incomplete and misleading". The Audit Commission in December 2004 found Scarborough Borough Council had "failed to fully protect" local and national taxpayers. No disciplinary action could be taken against Mr Rowell, the Penn Report said, because he had already left the council in August 2003 for a similar position on the Isle of Wight. North Yorkshire Police are looking into the whole Scarborough affair to decide whether or not there should be a criminal investigation. A spokesperson for HPR did not want to comment on either the Scarborough or Isle of Wight cases. Scarborough Borough Council did not want to comment either. Back on the Isle of Wight, about £2.9m of council money has already been spent on plans to repair Undercliff Drive. Last week those plans were completely scrapped after the Department of Transport withdrew £12.8m of funding. The cost of the disciplinary inquiry is estimated at about £1.3m, plus the salaries of the officers while they were suspended. Six years on the road is still cracked and diversions are still in place.